We leave you with all the highlights from the thrilling contest, until next time, its goodbye! 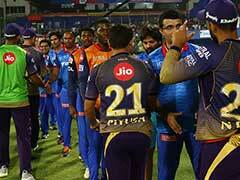 Delhi Capitals beat Kolkata Knight Riders by 7 wickets. Shikhar Dhawan 97* misses out his maiden IPL century as Ingram takes charge and dispatches the delivery from Piyush Chawla for a maximum. Thick edge off the delivery from Piyush Chawla and Colin Ingram will pick four runs from it. Delhi Capitals need 12 runs off 12 balls! Rishabh Pant tried to play a one-handed slog off Nitish Rana, but gives away his wicket at 46 off 31. Delhi Capitals 162/3 in 17.1 overs. 100-run partnership comes up between Rishabh Pant and Shikhar Dhawan as the former dispatches one for a maximum off Andre Russell. Cover drive from Rishabh Pant, Andre Russell doesn't looks at his best. Pant enters into 40s. Shikhar Dhawan dances down the pitch, picks the wrong-un from Kuldeep Yadav earn to hit it towards the sightscreen for four runs. 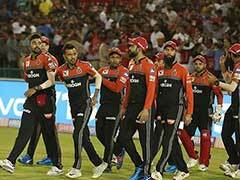 Delhi Capital need 43 runs in 32 delivers with 8 wickets to spare. Shikhar Dhawan opens the face of the bat, Andre Russell makes a diving effort but way out of his reach. He enters into the 80s with that boundary! Rishabh Pant goes a bit squarer to hit Piyush Chawla for four runs, 12 runs from the over. 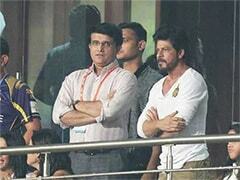 KKR need to find a breakthrough, the match is looking to slip away from them otherwise. Rishabh Pant hits the delivery from Piyush Chawla for four runs towards square. Both the left-handers are punishing KKR here. No stopping Shikhar Dhawan, he is punishing every lose delivery coming his way, eases this time through the covers off the delivery from Lockie Ferguson for four runs. Shikhar Dhawan hits a cover drive off Lockie Ferguson for four runs. Brings up the 50-run stand with Rishabh Pant for the third wicket. 100 up for Delhi Capitals in the 12th over! What a brilliant knock from the southpaw here, he did ride on his luck, but made the most of the missed opportunities from the KKR fielders. Can he go on to win the game for DC? Andre Russell giving some tips to his countryman before he bowls his first over in the match with the in-form Shikhar Dhawan on strike. Delhi Capitals 75/2 in 9 overs, the visitors have to score at 9.45 runs per over to win. Rishabh Pant takes on Kuldeep Yadav, hits it towards long off for four runs. Eight runs from the over. DC 72 for two in 8 overs. 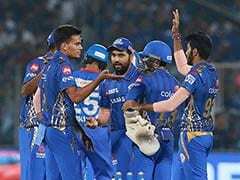 Five runs from Kuldeep Yadav's first over, Delhi Capitals 62 for two in 7 overs. Kuldeep Yadav to bowl the seventh over for KKR. 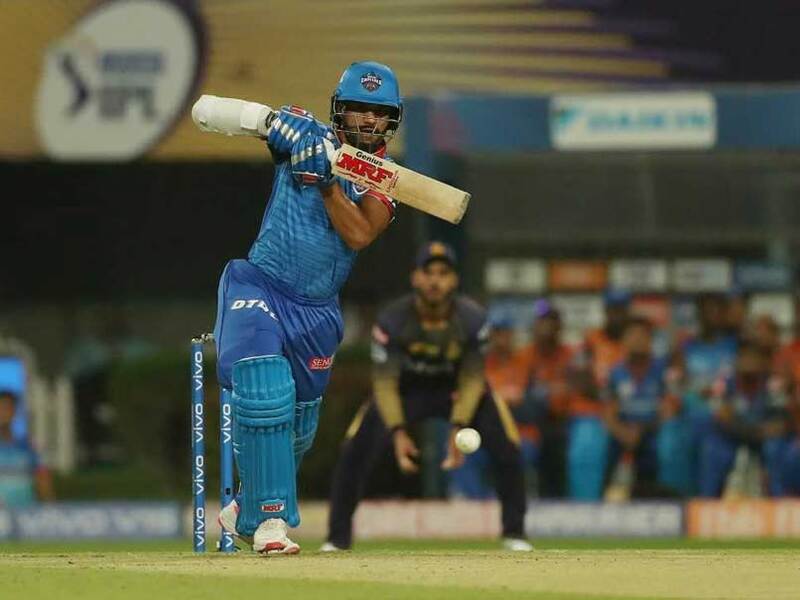 Shreyas Iyer plays a poor shot, nudges the delivery towards the leg side by Andre Russell, to hand an easy catch behind the stumps to Dinesh Karthik. Delhi Capitals 57 for two in 5.4 overs. Shikhar Dhawan latches on to the delivery from Lockie Ferguson and hits it through the covers for four runs. Delhi Capitals 55 for one in 5 overs. Brilliant shot from Shreyas Iyer after two dot ball off Lockie Ferguson, he will get off the mark with that boundary. Delhi Capitals reach the 50-run mark in the 5th over. Overpitched from Andre Russell, Dhawan punches it down the ground for four runs. Excellent start from the southpaw. Poor effort from Prasidh Krishna, the ball goes through his arms for four runs of Dhawan's blade. Andre Russell clearly not happy about it, Dhawan riding his luck here. Dinesh Karthik dives to his right to complete the catch behind the stumps, Prithvi Shaw thick-edged it, beautiful delivery from Prasidh Krishna. Delhi Capitals 32 for one in 3 overs. Poor delivery from Prasidh Krishna, wide outside off stump and Shikhar Dhawan makes no mistake to dispatch it for a maximum. Dinesh Karthik thinks Shikhar Dhawn has got a snick, umpire has soft signaled it for a not out. Review taken by KKR. Prasidh Krishna doesn't looks convinced though.... decision pending. NOT OUT given! Unlucky for KKR? Shikhar Dhawan, in the mood, steps up to hit Prasidh Krishna towards the on side for four runs. From the blade of Shikar Dhawan now, just guides the delivery from Prasidh Krishna for a maximum. Prithvi Shaw plays an upper cut to hit a maximum off Lockie Ferguson. 14 runs off the over, Delhi Capitals 15 for no loss after 2 overs. Prithvi Shaw opens the face of the bat to hit Lockie Ferguson square for a maximum in the fourth delivery of his first over. Lockie Ferguson to bowl from the other end for KKR. Delhi Capitals 1 without loss after 1 over. Shikhar Dhawan, playing his 150th match, is out for chase with Prithvi Shaw. Prasidh Krishna to bowl the first over for KKR. KKR post a challenging total of 178/7 in the stipulated 20 overs after a poor start.